We jumped down from the back of the Toyota ute, walked down a dirt track and around a corner and this is what we found. A guard of honour leading into the church! 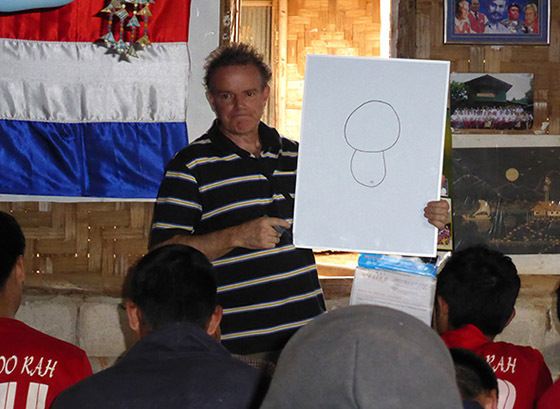 It's easy to feel you've been forgotten when you're living in a refugee camp far from your home village. Not many visitors ever make it to Wumpiem Refugee Camp, and there was great excitement on our arrival. 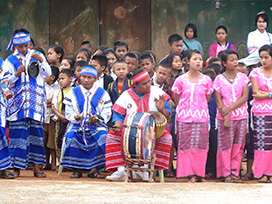 The Karen people enjoy a rich tradition of singing, dancing and music making and love to entertain guests. 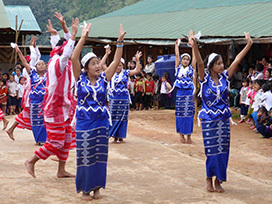 The Karen costumes are hand woven and stitched using traditional colours and designs. 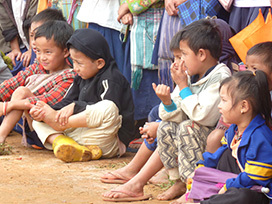 Adults and children alike are extremely proud of their culture. Some very proud art students from Wumpiem Secondary School. Cartooning is a fantastic means of expression. Once you learn a few simple skills you can practise over and over, and have a lot of fun drawing your own cartoons and making up your own characters. 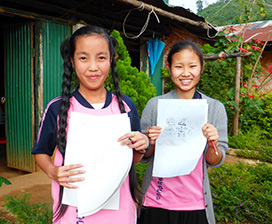 One hundred and fifty thousand Karen people live in refugee camps inside the Thai border. 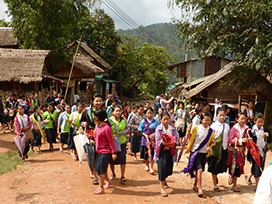 Umpiem Refugee Camp is up in the mountains and a long way from anywhere. 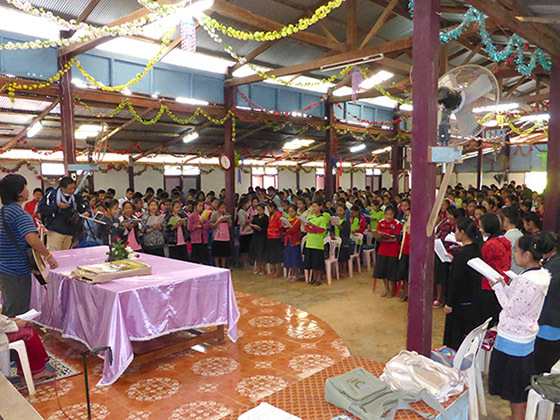 The people at Umpiem were very excited that we had come so far to pay them a visit and offer them encouragement. 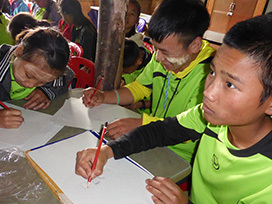 Many Karen families from Umpiem have settled in Australia, but a permanent peace deal with the Myanmar Government is the ultimate aim for the Karen people, as they seek to build a safe and secure future for their children. 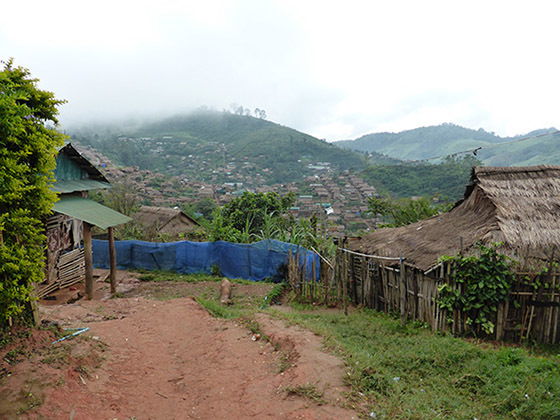 Simple houses of timber, bamboo and thatch cling to the sides of the Umpiem mountains. 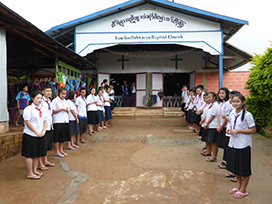 The church was full of school students celebrating our arrival. Super Chicken is about to fly over the mountains of Umpiem! 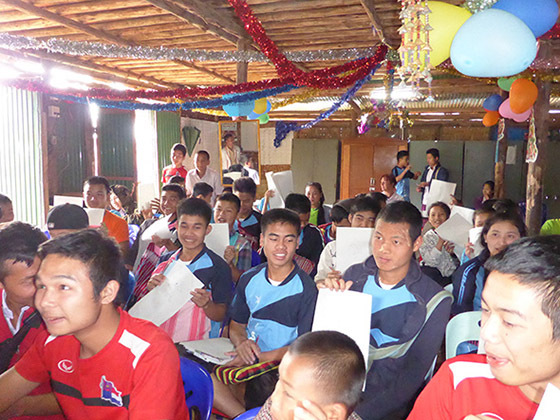 Cartooning in the art class at Umpiem Secondary School.